Today, we are here with another solution for our readers. Those of you who want to activate your recently unlocked iPhone without updating to the latest iOS firmware. Have you received a confirmation email that the iPhone is unlocked? If yes, you need to do a restore with iTunes, but you might be afraid of losing your data or the untethered jailbreak. Don’t worry, we’re here to facilitate you so you can activate your recently unlocked device without losing any data while preserving your iOS 5.1.1 untethered jailbreak. Step 1: Jailbreak your iPhone. Step 4: After SAMPrefs is installed, an incon in Yellow will be visible on the Springboard saying SAMPrefs. Launch it. Step 5: Now head over to utilities and de-activate the iPhone. Step 6: After that, insert the desired SIM card on the remote factory unlocked iPhone. Step 7: Once finished. Open iTunes to activate the device. Once activated, a message will arrive stating the iPhone has been unlocked. That’s it. Step 1: Download the latest redsn0w version. Step 2: Connect the device to the computer and open the rednsn0w software. Step 3: Click the ‘Jailbreak’ option. The iPhone is going to be connected in a ‘Normal’ state, but the device needs to be put in DFU mode. 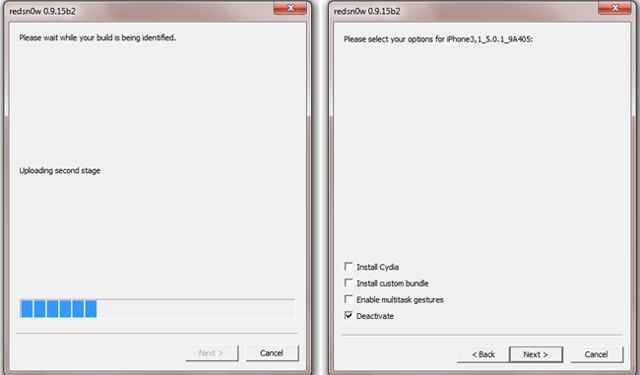 Step 4: Now the build version of the phone will be detected by redsn0w. Step 5: After the successful detection of the build, a few options will be presented to you by rednsn0w. Check ‘Deactivate’ and un-check all other options, including Cydia. 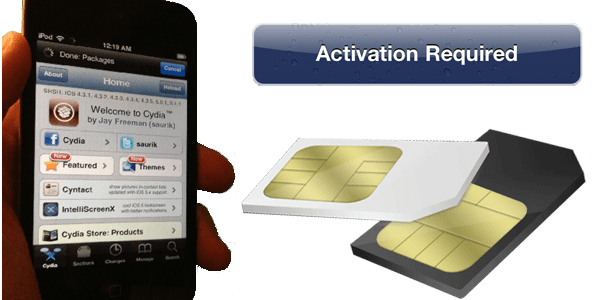 Step 6: After the completion of the deactivation, remove the SIM card and turn off the device. Step 7: Now turn on the iPhone, connect it to iTunes, and insert the SIM card. If you did everything right, the unlock confirmation message will be displayed by iTunes. Step 1: Find an activate Wi-Fi connection (at home or office). Step 2: Once the confirmation has been received for the unlock, remove the official SIM card (AT&T in our example) from the iPhone. Step 3: Insert some other SIM card e.g Verizon SIM card. An ‘Activation Required’ message will pop up. Step 4: Connect the device to the active Wi-Fi network, and let the iOS do the rest. We have tested all these steps, and they are legit. We also hope these steps were able to solve your problems. In the end, we recommend you to take the factory unlocking service from Official iPhone Unlock. They have been tested, and we can confirm they are the only reliable factory unlock service providers out there. Use this verified service to get the iPhone unlocked, while not losing any data or the untethered jailbreak. Feel free to leave comments.